There’s finally a reason to purchase a new computer. No, there isn’t a new secure version of Windows. There’s a new chip from Intel which works like having a two processors in your machine. Its called Intel® Core™ 2 Extreme. According to Intel's benchmark data the performance is almost double for most tasks although they only claim a 40% increase. I have to admit, everything I’ve tested has been at least 50% faster which is wonderful. One Visual Basic program I created to analyze WinPatrol PLUS requests used to take 2–3 hours, now runs in under 10 minutes. I’m sure increasing my memory to 4 GB also helped. There is one danger however that you must consider. 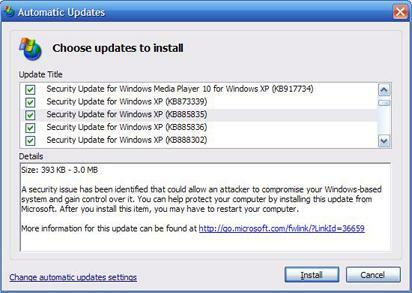 Most new computers may include Windows XP SP2, but they may lack a year of weekly security updates. What you see above are just a few of the over 50 security updates I needed to install on my new Gateway FX510 system. If you get a new computer or you have a student with a new laptop you MUST make sure they install any available Windows updates. It should be the first task you do after installing WinPatrol on any new machine. Until you install all available updates, you won’t want to visit any unknown websites. You won’t want to leave your computer on all night connected to your cable modem. You won’t want to let your kids visit their friends on MySpace. 4gb? Bill, how the heck did you manage to get XP to recognize having 4gb? So far it looks like recognizing anything more that 3gb of RAM has been purposely disabled(perhaps to sell more Server2003? ).